In a recent paper (Farhi and Gourio 2018 ), we propose a simple accounting framework to empirically distinguish between these different stories. Our framework builds on the standard neoclassical growth model, the backbone of modern macroeconomics. This framework is often used to understand quantitatively the behaviour of the ‘big ratios’ emphasised since Kaldor – the investment-output and capital-output ratios or the labour share. Our main innovation is to introduce risk in a tractable way, which allows us to analyse financial variables such as the price-dividend ratio, Tobin’s Q, or the risk-free rate. This innovation is, of course, also required to entertain the risk premium story. Barkai, S (2017), “Declining labor and capital shares ”, London Business School working paper. Crouzet, N and J Eberly (2018), “Understanding weak capital investment: The role of market concentration and intangibles ”, Jackson Hole Economic Policy Symposium, Federal Reserve Bank of Kansas City. 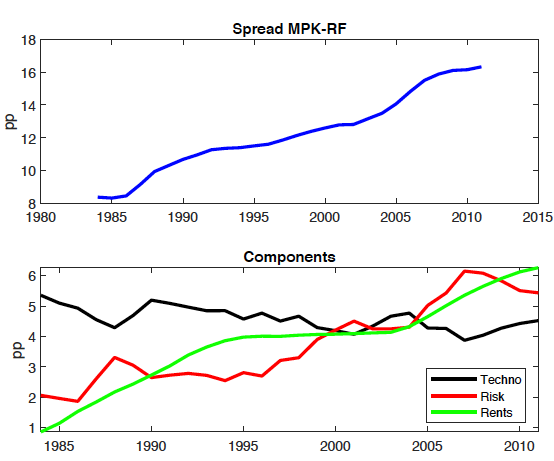 Farhi, E and F Gourio (2018), “Accounting for macro-finance trends: Market power, intangibles, and risk premia ”, Federal Reserve Board of Chicago working paper WP-2018-19. Furman, J and P Orszag (2015), “A firm-level perspective on the role of rents in the rise in inequality ”, working paper. Marx, M, B Mojon and F Velde (2017), “Why have interest rates fallen far below the return on capital ”, Federal Reserve Bank of Chicago working paper.